MONKEYS ARE MY FRIEND: One Down! This weekend I finished up my first pair of socks for 2015. I've dubbed them my Cap'n Blueberry socks. One pair down, eleven more to go! Of course, I am trying to expand my knitting horizons a tad (as fun as knitting just socks would be, I'm trying to keep some variety in my projects), so my current project is a striped cardigan. A variety of criteria played into what colors I chose for this sweater, not all of them aesthetic. (One important factor was what would give me enough yardage to actually make a sweater.) This resulted in a color selection that was... a bit outside my norm. But I think the colors actually work well together even if they aren't the first color combination you think of when thinking of me. 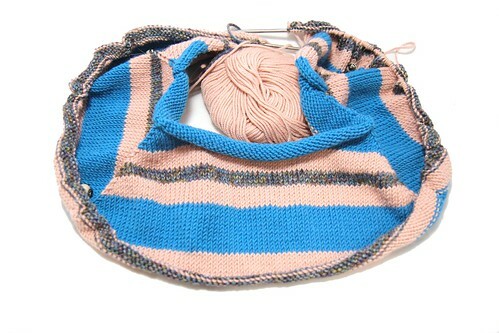 I think it will end up a funky but fun sweater. Hopefully I'll see in a couple of more weeks! Thank you! It's a different color combo, but I'm liking it.